In last week's Sunday Soul Food post, I wrote about tearing down the ungodly strongholds of wrong ways of thinking, reacting, responding and behaving in our lives and strengthening the godly stronghold of the Holy Spirit in our inner being. We do this through cooperating with God using the tool of His Word to renew our mind. Today I want to share the simplicity of God's plan on how this is done using Ephesians 4:22-25 (Amplified Bible, Classic Edition). 22 Strip yourselves of your former nature [put off and discard your old unrenewed self] which characterized your previous manner of life and becomes corrupt through lusts and desires that spring from delusion;23 And be constantly renewed in the spirit of your mind [having a fresh mental and spiritual attitude],24 And put on the new nature (the regenerate self) created in God’s image, [Godlike] in true righteousness and holiness.25 Therefore, rejecting all falsity and being done now with it, let everyone express the truth with his neighbor, for we are all parts of one body and members one of another. I hope you'll pardon me for using a simple word picture that will help you to remember these simple steps by relating the steps of renewing the mind to the steps involved in changing a baby's diaper. Step One-Recognize that your thinking stinks and choose to take it off. (v.22) When we are born again we become a new creature in Christ Jesus. But, our body doesn't instantly change does it? Being a new creature in Christ doesn't mean we instantly become a perfect specimen of physical fitness and beauty does it? Likewise, when we become a new creation in Christ, our old ways of thinking, reacting, responding and behaving are not instantaneously transformed either. We have to cooperate with God by recognizing when our stinking thinking doesn't line up with His truth and choose to take it off. Why is this so vitally important? It's because our thoughts become our actions. Step Two-Wash up. (v. 23) When you remove a baby's messy diaper, you must wash the baby up, right? This could involve anything from a simple wipe down with a baby wipe to a whole body bath depending on the amount of mess involved. Some wrong ways of thinking, reacting, responding and behaving in our lives seem to respond easily to the washing of the Word. Some stubborn strongholds require a relentless power washing in the Word. The point is, the Word of God is the washing agent that the Holy Spirit uses to get rid of our stinking thinking. You will not experience a renewed mind and a transformed life without the Word! Step Three-Put on God's Truth. (v. 24) After you remove a baby's messy diaper and wash the baby up the next step is to put on a clean diaper. When we recognize a stinky stronghold in our life and take it off and wash our mind and heart with the Word, we have to follow up by putting on God's new way of thinking. Trying to simply get rid of a wrong way of thinking by not thinking about it is like me telling you not to think about a pink elephant. Immediately your mind envisioned a pink elephant, correct? That old stinky way of thinking must be replaced, not just removed. It must be supplanted by planting God's Truth in your mind and heart in its place. Step Four-Sniff out falsity and reject it. (v.25) A mother doesn't just change her little one's diaper once and assume that she's taken care of the problem for good. Her nose is attuned to the smell that alerts her to the fact that it's time for another diaper change. Similarly, our spiritual nose, aka discernment, must be attuned to falsity, to all areas of thinking, reacting, responding and behaving that are not in alignment with the plumb line of God's Word. We have to stay vigilant in order to stay clean and free of stinky strongholds! I encourage you to highlight and study these verses in Ephesians 4:22-25 and to remember this simple word picture. A renewed mind is key to an overcoming life! Anne, thank you for stopping in! Elizabeth's comparison certainly does help us relate! Great analogy, Elizabeth! I've been reading though Jerry Bridges book The Discipline of Grace and Chapter 9 deals with this very thing. One of my favorite quotes from the chapter, "It is not enough to pray that God will enable us to deal with a volatile temper; we must also ask Him to help us put on compassion and kindness." Paul uses the analogy of taking off and putting on throughout Colossians as well. Good stuff! Blessings on your Sabbath, friend. 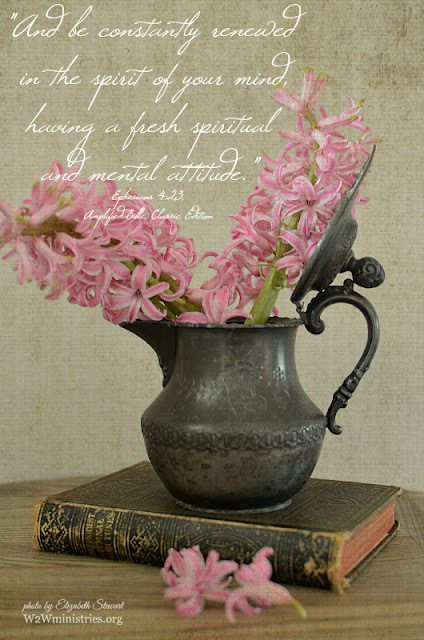 June, thank you for stopping by the blog today and thank you for sharing the quote! We love it! Learning to pray is a matter of doing it for me. The more you pray the more you want to pray.